Seattle is the country’s 18th-largest city, but only New York and Los Angeles have a larger homeless population. In April, the Seattle City Council proposed a “head tax” on employees at big businesses to fund low-income housing and homeless shelters. While there are hundreds of qualifying companies with gross annual revenues of more than $20 million, one is quite a bit larger than the rest. On Wednesday, Amazon responded. Pending the May 14 council vote, a spokesman said, the company would put on hold the construction of one new downtown office tower, and threatened to merely sublet, rather than lease, in another. The ultimatum comes as some Seattleites fret about their biggest company’s wandering eye: Amazon has recently announced major expansions in Vancouver and Boston, and is on the hunt for a second-city headquarters. The clash is a long time coming. In cities like Seattle, corporate wealth has come roaring back, alongside social crises. Seattle has responded with a pioneering—and controversial—minimum wage ordinance. Now the city is upping the ante, asking local employers to pay for an affordable housing crisis that many locals believe is their fault. Amazon is a particularly interesting target. Its unparalleled size has given it the solid appearance of a local anchor institution. 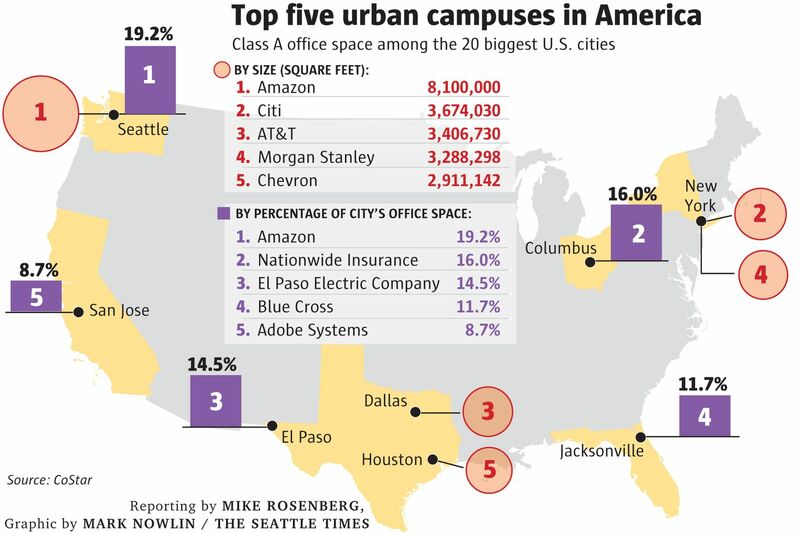 The company occupies more than 20 percent of Seattle’s Class A office space, and has more than twice the footprint of the next-biggest U.S. corporation in any city (Citi’s 3.7 million square feet in New York). Seattle councilmember Mike O’Brien, one of the bill’s sponsors, estimated that Amazon might pay $20 million a year under the resolution, which is projected to raise $75 million next year. In other words, it’s kind of an Amazon Tax. The company is not exactly hard-up: Last week Amazon reported a quarterly profit of $1.6 billion, and in an interview about his space tourism venture, founder and CEO Jeff Bezos effectively said that only extraterrestrial travel was a big enough dream to match his fortune. But the retailer’s response seems designed to send a message: Don’t take us for granted. Amazon’s prickliness is ironic. The company has dangled the prospect of its HQ2 in a grotesque contest to see which city will do the most for the e-commerce giant, maintaining (at least publicly) that it could plant itself in any one of 20 North American cities. And right as Amazon is asking American cities for more, more, more to secure an influx of 50,000 Amazonians, Seattle has asked the company to take greater responsibility for the city’s social ills. The company’s unparalleled groundedness should give Seattle pols the confidence to go on the offensive. That’s a big shift. A core tenet of urban policy in the United States since the 1975 New York City fiscal crisis has been that a municipality’s job is to drive corporate growth. Prior to the ‘70s, New York had built a pretty impressive five-borough welfare state, complete with free higher education, free admission to the country’s largest museum, and a host of free public health services. The city’s brush with bankruptcy—together with the (related) exodus of corporate HQs to the suburbs and the South—discredited that model. The investment banker Felix Rohatyn, who supervised the city’s debt restructuring, wrote that going forward, cities would understand that “business has to be supported and not just tolerated.” More recently, Detroit, whose budget was only released from state oversight last week, has served as the poster child for urban liberalism run amok, and the city’s job loss and bankruptcy have served as a warning to other mayors eyeing social welfare policies. But in a good number of cities, the bad old days of abandonment are out of sight, while homelessness, hunger, and poverty remain. If the city’s chief mission is to create a business-friendly environment, it seems that in many places, the mission has been accomplished. Instead, many on the urban left—epitomized by mayors like New York’s Bill de Blasio or Jackson, Mississippi’s Chokwe Lumumba—increasingly see the city as the vanguard of the welfare state. Local initiatives like the minimum wage and sick leave are popular examples of this trend. But the road ahead is tough: States bar meaningful local action. CEOs continue to make threats. Fragmented metro areas have given companies leverage, even just to move next door. And most corporations have polycentric structures that make them both more flighty than their predecessors and also less appealing as a target for redistribution. In a way, Amazon’s predicament in Seattle—for now the only place it really calls home—is a callback to the realization that major U.S. manufacturers had after the World War II: Size is an advantage, but concentration is a vulnerability. When automakers downsized and relocated south and west in the ‘50s and ‘60s, they were largely responding to costs imposed by labor, not local governments. But the money-saving benefits of decentralization were the same then as they are now, while the drawbacks—challenges in communication and transportation—have largely evaporated. Even inequality-minded mayors have been wary to challenge the ancient wisdom that corporations (and wealthy residents) jump ship at the mention of new taxes. “I’m deeply concerned about the impact this decision will have on a large range of jobs — from our building trades, to restaurant workers, to nurses, manufacturing jobs and tech workers,” Seattle Mayor Jenny Durkan said about Amazon’s announcement. Other Democratic mayors have been similarly unwilling to challenge the status quo. But the council members who sit below them are in almost all cases more radical. Local redistribution policies are on the rise. In most places, mayors are too nervous to put pressure on employers who push back. Seattle is one place where the biggest corporate target also seems—even as it plots its expansion elsewhere—too big to move.